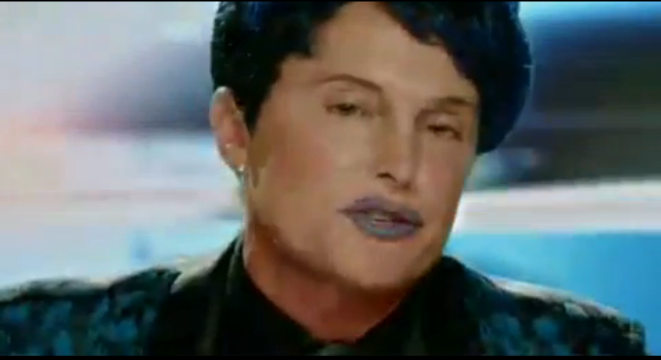 Bruce Jenner wears a wig and blue lipstick for his role in a new comedy. There's a reason Bruce Jenner threw on some blue lipstick ... his favorite Kris Jenner wig ... and shaped his eyebrows perfectly -- the guy just got a NEW MOVIE ROLE, TMZ has learned. Jenner scored himself a part in the upcoming flick, "The Hungover Games" ... which spoofs "The Hunger Games" and "The Hangover" ... along with other films like "Ted" and "Django." As for Bruce's role -- he plays one of the weird futuristic "Hunger Games" play-by-play announcer guys ... alongside former NFL star Hank Baskett. No word when the film will be released. It's not Bruce's first acting gig -- he's been in all sorts of stuff including, "CHiPs," "Murder She Wrote" and "Can't Stop the Music." Memba the crop top???? LMAO...Now Bruce can be all that he can and always wanted to be! He just strolled on out the box. Supposedly he's a cross dresser and now he can freely express his inner tramp. Looks better than Kris...btw don't wanna see no damm spoof of django ugh! Yeah, I think so. But it could be much better. I knew it!! Bruce is slowly coming out of the closet. Damn, I guess.